Team Telefonica competes during the stage one start of Leg 4 to Auckland in the Volvo Ocean Race at Sanya, Hainan Island on February 19, 2012. Spanish boat Telefonica’s hopes of a fourth leg win in a row in the Volvo Ocean Race were hanging by a thread Sunday after falling 138 nautical miles off the lead in the race from China to New Zealand. Skipper Iker Martinez, the joint 2011 world sailor of the year, has barely made a mistake in the nine-month, 39,000 nautical mile race around the world, which finishes in Galway, Ireland, in July. 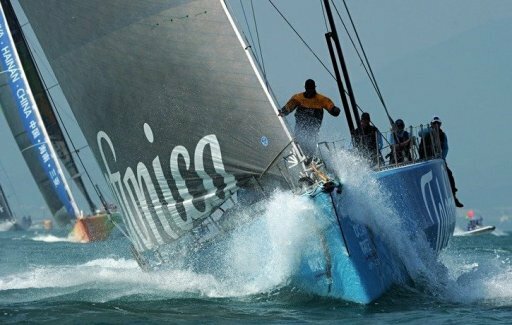 But Telefonica have been off the pace in the leg from Sanya to Auckland, and a treacherous trek through the Solomon Islands in the Pacific only slowed the Spaniards as they chased leg leaders Groupama of France. Telefonica lay third, 57 miles behind second-placed Puma who were in turn 80 miles adrift of Franck Cammas’s Groupama crew. The US-led Puma’s pursuit of Groupama was hampered on Saturday after a torn jib needed to be hastily hauled on board to be sewn back together. Camper, the fifth-placed Spanish/New Zealand entry, suffered a similar setback earlier in the week. The six-strong fleet have just over 1,500 nautical miles still to sail to Auckland and are expected to arrive by next weekend.